to the escape hatch! : Let's #LAMBWatch Demolition Man on September 7th! Let's #LAMBWatch Demolition Man on September 7th! LAMBs and LAMBettes! It's time for another installment of #LAMBWatch, where we (virtually) watch The LAMB Movie of the Month together and tweet along. Break out the three seashells because this month's movie is Demolition Man, courtesy of Jay from Life vs. Film. #LAMBWatch is happening on Saturday, September 7 at 4:00 pm EST. Our second installment of #LAMBWatch will be a little tricky in that the film's not on Netflix Instant (Double Indemnity was). 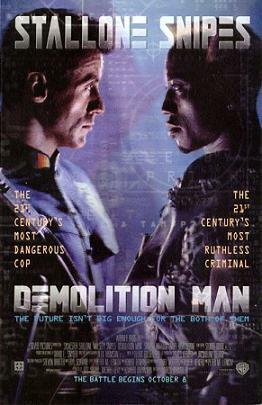 I have Demolition Man on DVD so I'll be watching it that way but it looks like it's available for rent on Amazon Instant for $2.99. #LAMBWatch is fairly simple - when the clock strikes 4:00 EST on the 7th, just hit play (you might want to do a run-through ahead of time to make sure that when you hit play you get the film and not some trailers or ads or something)! You can use #LAMBWatch to join in on the conversation. Click here to get a feel for last month’s installment. Nice blog. I like film, music and other multimedia news.